July 15, 2013: High above our planet in the realm of satellites and space stations, the familiar rules of Earth do not apply. The midday sky is as black as night. There is no up and no down. Dropped objects do not fall, and hot air does not rise. Of all the strange things that happen up there, however, it is possible that the strangest happens to coffee. 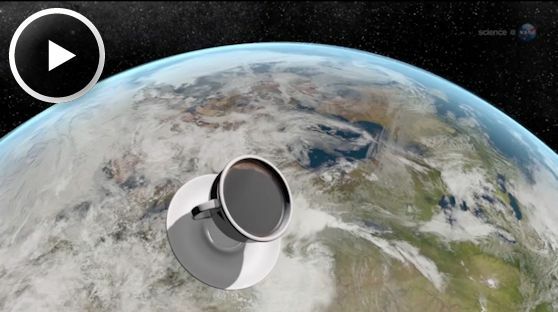 "But, for the sake of argument, let’s suppose you are on the space station and you have a cup of coffee in your hand.” The most natural thing would be to tip the cup toward your lips, but when you do…. "The coffee would be very hard to control," he continues. "In fact, it probably wouldn't [come out of the cup]. You'd have to shake the cup toward your face and hope that some of the hot liquid breaks loose and floats toward your mouth." On the bright side, you will probably be wide awake by the time the cup is empty. Coffee is not the only liquid that misbehaves in space. Cryogenic fuels, thermal coolants, potable water and urine do it, too. The behavior of fluids is one of the most un-intuitive things in all of space flight. This poses an extreme challenge for engineers designing spacecraft systems that use fluids. "Our intuition is all wrong," laments Weislogel. "When it comes to guessing what fluids will do in new systems, we are often in the dark." 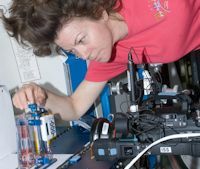 To develop a better understanding of fluids in microgravity, Weislogel and colleagues are conducting the Capillary Flow Experiment onboard the International Space Station. For instance, one of the devices in their experiment suite looks at "interior corners." If two solid surfaces meet at a narrow-enough angle, fluids in microgravity naturally flow along the join—no pumping required. This capillary effect could be used to guide all kinds of fluids through spacecraft, from cryogenic fuel to recycled waste water. The phenomenon is difficult to study on Earth, where it is damped by gravity, yet on the space station large scale corner flows are easy to create and observe. Weislogel and colleagues have already been granted three patents for devices invented as a result of their work. One is for a microgravity condensing heat exchanger. Another describes a device that separates and controls multiphase fluids. The third patent is for--you guessed it-- a low-gravity coffee cup. Astronaut Don Pettit, who worked with the Capillary Flow Experiment during his time on board the ISS, helped invent the cup, and he shares the patent along with Weisogel and two mathematicians, Paul Concus and Robert Finns, who performed the first theoretical analysis of the phenomenon. Basically, one side of the cup has a sharp interior corner. In the microgravity environment of the space station, capillary forces send fluid flowing along the channel right into the lips of the drinker. "As you sip, more fluid keeps coming, and you can enjoy your coffee in a weightless environment-- clear down to the last drop," says Pettit. "This may well be what future space colonists use when they want to have a celebration." Indeed, the patent application specifically mentions "toasting" as one of the uses of the device. It’s easy to imagine what they might be toasting: toilets and air conditioners and fuel tanks and recycling systems, working better thanks to capillary flow experiments on the ISS.